Kochi, 12th February, 2017: In a rare occurrence in the world of Kerala basketball, champions of two separate generations assembled and shared pleasantries. 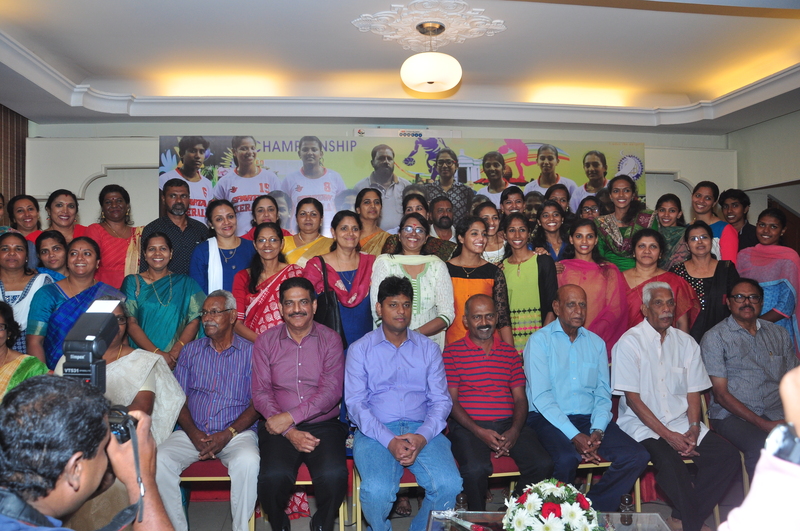 The whole meeting was a great sight to behold and such a meeting was facilitated by the 1984 Women’s Champions – the 1st ever Kerala women’s team to win the championship. They were joined by the Regional Sports Centre, Kochi and Ernakulam District Basketball Association, who felicitated the present players of the Kerala women’s basketball team that won the title after a gap of 32 years during recently conducted National Basketball Championships held at Pondicherry. The entire felicitation took place at the Rajiv Gandhi AC Indoor hall in Kadavanthara, Kochi yesterday. The entire squad that won the recent championship had arrived, however, the championship side of ’84 missed three of their stalwarts – Late Dr. Raji Thampi, the captain of the team, Dr. Nisha Annie Jacob, presently residing abroad and Prasanna Kumara (Jayasankar), who had work commitments. The other members of the squad namely Emily K, Molly Mathew Augustine, Jaya Kumari, Mercyamma Sebastian, Sheebamma Augustine, Joshiamma George, Renny M Vincent, Ancy Mathew and Bindu Rajapan – who flew all the way from Kolkata to attend the function. K V Alexander, the former international player from the Air Force and Antony Stephan were also present. The coaches of the ‘84 batch also attended the function including international coach and referee Thomas J Fenn, Raveendran from Alappuzha, C C Annanmma, V V Paul and C P Michael. The function was chaired by P J Sunny and Shri K Mohammed Y Saifulla, IAS Collector of Ernakulam was the chief guest of the day. He was welcomed by SAS Navas Hon. Secretary RSC. Other felicitations included Sri K V Alexander, Molly Mathew, Mohammed Iqbal – former international player and President of Team Rebound, K A Raju – President of Ernakulam District Basketball Association. The vote of thanks was given by Adv. K A Salim. Other dignitaries present also included internationals V.V Harilal, Leelamma Thomas, C V Sunny, Subash J Sheoy, Indulekha, international referee F R Philips, Wadakae Kalam and an array of former state and university players​.